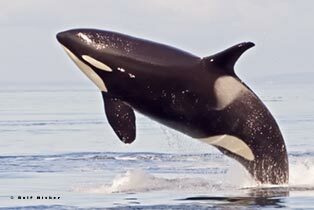 Killer Whales ( Orca Whales ), Humpback Whales, Bald Eagles and more...whale watching pure! Make sure to check out our Killer Whale Pictures and our Whale Watching Pictures! You also should check out this blog about whale watching in British Columbia, Canada. Small islands spread out before us, their ruggedness a contrast to the dark green water swirling around them. To the north we see the coastal mountains of British Columbia, BC, capped by snow and glaciers. Kelp is drifting on the water surface. It is so peaceful here in the middle of Johnstone Strait off Northern Vancouver Island, we are whale watching in BC. Suddenly a black fin appears and cuts through the water. It is a killer whale. Water runs over the black body of the emerging Orca. As it surfaces the whale blows a fine mist which drifts through the air. The gentle exhaling blows sound soothing. A short dive follows. 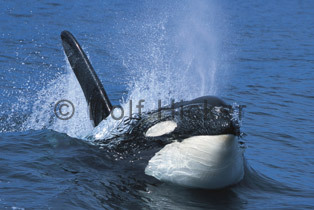 Suddenly the Orca Whale leaps high into the air and exposes the marvellous black and white pattern of its belly. The animal splashes back into the water and disappears. The silence is broken as our fellow passengers clap their hands and shout for joy. What a great first experience on this BC, British Columbia whale watching adventure! We are on board a BC whale watching vessel which has brought us to see the Killer whales of Johnstone Strait, British Columbia, Canada. Johnstone Strait is a waterway that lies between the mainland of BC and the east coast of Northern Vancouver Island. It is here that the northern resident whales gather from June through October. Foraging for salmon they travel in small matriarchal groups throughout the coastal area returning every year much to the joy of all whale lovers. 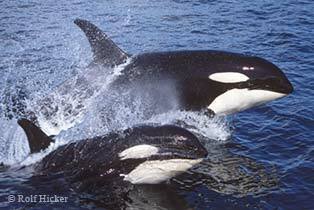 Orcas have a strong sense of family and live in stable social groups called pods or subpods. In the past they were hunted down by those who thought they were cruel monsters. People believed that Orcas were a merciless killer whale. But in the 1970s scientific research showed a different picture of the Orca as that of a highly intelligent social animal capable of language and complex social behavior. The killer whale hunted and once hated suddenly gained love and respect and became a symbol for peace and hope. 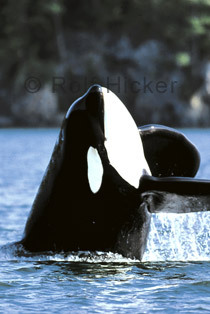 Today British Columbia takes pride in these intelligent gentle giants and whale watching in BC became a mayor industry. Whale watching tours in Johnstone Strait are available from Telegraph Cove, Alert Bay, Port Hardy, Port McNeill and Sayward, each community is fringed by the pristine waters of the Inside Passage route. Whichever whale watching tour operator, there will be plenty of interesting information on the living and social habits of the Orca. The information is provided by Naturalists who enthusiastically share facts about the Marine Mammals they have studied which inhabit the surrounding waters. Passengers from around the globe share in a remarkable day of discovery and mingle easily with each other since they all have a common point of interest, the Orcas. We eagerly exchange travel tips and share stories while drinking a nice cup of hot coffee. We can barely wait to see the whales and everyone is excited. Standing on the deck of our chosen whale watching vessel we hear somebody shout "A dolphin!". As we look into the water we discover white sided dolphins frolicking in our bow wave. There appear to be about 50 animals jumping and diving close to the boat. The grin on their faces seems to say to us: "Hey, we know you enjoy our show." After a while they lose interest and leave us perhaps for something more interesting. "A bald eagle on the right!" the Captain announces to us over the intercom. There is a Bald Eagles nest high on top of a stately fir tree. The beautiful rugged coastline passes by. Still no whales. The Captain takes us to a colony of seals which are sunning themselves and enjoying a peaceful moment. The boat passes another island and suddenly the Captain is back on the intercom, "I have good news folks." Good news? That has to mean that there are whales around. Off the port side we see the spray of several blows in the distance. As we near the whales the Captain turns off the boats engine. The Killer Whales are heading toward the boat as if they want to say hello to an old friend. Over the hydrophone, an underwater acoustic listening system, we can hear the Orcas chatting back and forth to each other. There is a long whistling weeee ooooouu uupppp sound and a sudden short squealing. What are they saying to each other? It is a pity that we do not understand them. But for right now it is wonderful just to listen to these melodious and mysterious songs. Close to the boat the Orcas are starting to play. They slap their tails and one of them is curious enough for a little spyhop. But after several hours out on the water it is time to turn back and leave the whales. As we head for the harbour we know in our hearts that everyone who has listened to the songs of the Orcas will be bound up with them for a lifetime. Whale watching from Vancouver Island is the best place in British Columbia to see killer whales and Humpback Whales in the wild.